The Washington Bill of Sale Forms are considered legal documents in the state of Washington, to provide proof of legal sale and purchase of various items, mechanical and otherwise. These documents will provide necessary identifiable information pertaining to items being sold as well, information regarding the buyer, seller and change of ownership. Some documents require notarization. Firearm Bill of Sale – The exchanging of a gun for trade. General Bill of Sale – This form is usually completed by parties who would like to provide proof of sale and purchase of personal property. 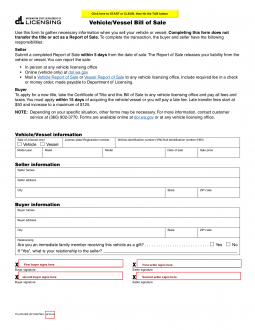 Vehicle or Vessel Bill of Sale – Complete this document to show proof of a legal sale and purchase of a vehicle. The same document may be used for the sale and purchase of a vessel/boat. This form may be required for registration and titling of either. If you’re a new resident or have purchased a boat from outside of the state, you will require your title and out of state registration. If you are unable to produce these documents, contact your local DOL Office for further instruction.